In 1921, before most of us were born, a remarkable study began tracking the loves and lives of 1500 Americans from childhood to death. 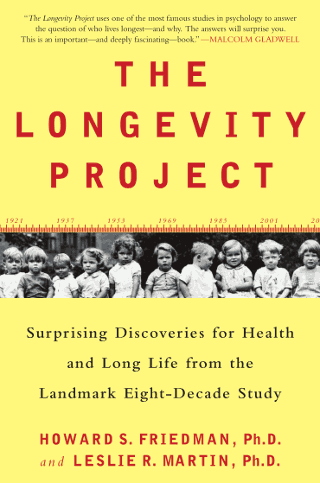 The study continues even today, with research teams led by Howard Friedman still keeping tabs on the remaining few who are still alive and analyzing massive amounts of data to establish what it is precisely about these 1500 individuals that led some to stay well and others to fall ill or die before their time. Incredibly, no one until now has chronicled and interpreted the findings from this monumental almost century-long project for the general public. Is longevity associated with being married, daily jogs, living with pets, or faith in God? At last, with lucid prose and rigorous yet crystal clear analysis, Professor Friedman and Professor Martin have succeeded beautifully.